Food will be available at the pub all day from 12 noon, including evening meals. Invited weekend performers include Will Duke, Andy Turner, Annie Dearman and Steve Harrison, and Peter Collins. STOP PRESS – we’ve just learned that the pub will be doing meals from 7pm, which might well be useful to anyone who is staying through to the evening! Andy Turner sings, plays anglo-concertina and one-row melodeon. He was born and bred at Ashford, and first became involved in the folk scene in Kent. In the 1980s, he danced with Oyster Morris, was an occasional member of the Oyster Band, played in a duo with Chris Wood and, along with Chris, was a member of local dance bands including Polkabilly and the Old City Band. Finding that songs from Kent were under-represented in published collections, he also began to research local singers, and was fortunate to meet Charlie Bridger, a fine singer from Stone-in-Oxney. Andy brought Charlie along to the English Country Music Weekend at Frittenden in 1986, and this was one of the last times Charlie sang in public before his death in 1988. 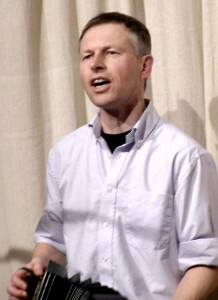 Andy has lived in Oxfordshire since 1987. 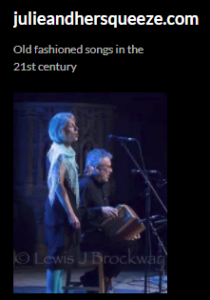 In addition to his solo performances, he is a member of English Ceilidh band Geckoes, Oxford-based concert band Magpie Lane, West Gallery choir The Christminster Singers and in a duo with Bampton fiddler Mat Green. 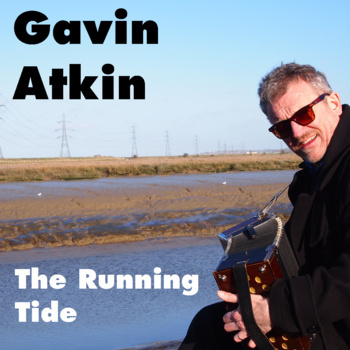 Despite being so busy living in exile, he maintains a strong interest in songs and singers from Kent, and has recorded several Kentish songs, both under his own name and with Magpie Lane. His repertoire includes items noted down in the county by early collectors such as Cecil Sharp and Ralph Vaughan Williams, from the post-war collection of Francis Collinson, and from singers recorded in the last few decades by Mike Yates and others – including George Spicer, the travelling Willett family and, of course, Charlie Bridger. You can also find him at Myspace. Here are some short samples of Andy’s excellent singing. The first is of Andy singing with his wife Carol Turner, and is a version Sharp collected from James Beale of Warehorne. The second is a version of Spencer the Rover collected by Vaughan Williams from Mr & Mrs Truell of Gravesend.